I am trying to lean into the pain of losing you. Your rump collapses when you lean to pee, when you curl to poop, and when you turn to look at me as you walk. Now I lean on my walker to help you stand by tugging on the handle of your Help Me Up Harness. Maybe you need more pain medicine. Maybe you need a different pain medicine. Maybe your time is coming to an end. I must sit and rest, let watershed tears roll. Soon I must summon the courage to carry you when final carrying must be done. So much sadness! Heart’s breaking on all accounts. Thank you for commenting. This story is dear to my heart. I agree. I think this is a special (awful) kind of heart breaking. 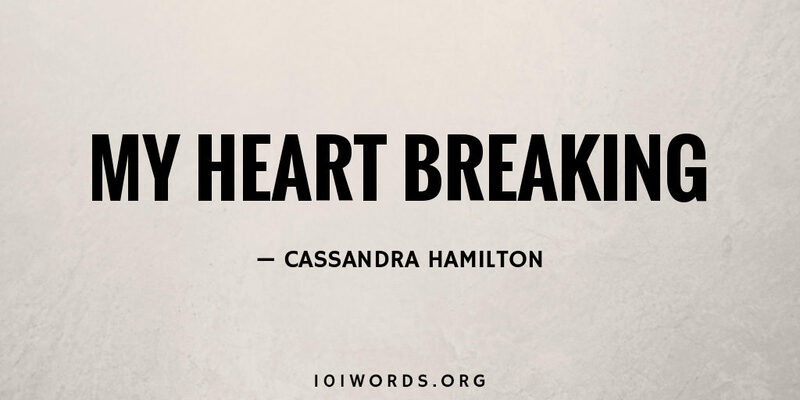 This is beautiful and heartbreaking Cassandra. Thank you, Morgan. I appreciate your thoughts on this! Oh Cassandra. Such a true, sad story. ? Thank you, Ava. This was inspired by true events. Unfortunately. Beautiful expression of your love, loss and sadness! Thank you, Valerie. I think the best choice for losing love is it to make art from pain … and share the ideas of love. So many dog owners know this story too intimately. I love the way you evoke joined and shared Courage – of the bodies of both of you to continue to the last; and of Carrying of the body – of one for the other at the end. Beautiful images and emotions of shared bonds and Care ??? Thank you, Debbie, for your sharing your thoughts on this piece. Shared Courage (with a capital “C”) – great idea you bring forth. I think that is a truth of the moment I described. Then, the carrying of the body of a loved dog … that is a horrible thing to imagine and do. Bless those that do it – and bless those people (like vets and vet techs) that do it for owners who can not do the carrying. Yes, yes, yes. Last dying dog, I drove her to the vet…weeping. Now, on my mobility scooter??? Now on walker … lifting dog with HelpMeUp harness. Unfortunately life fed this fiction. So sorry you know this kind of loss.